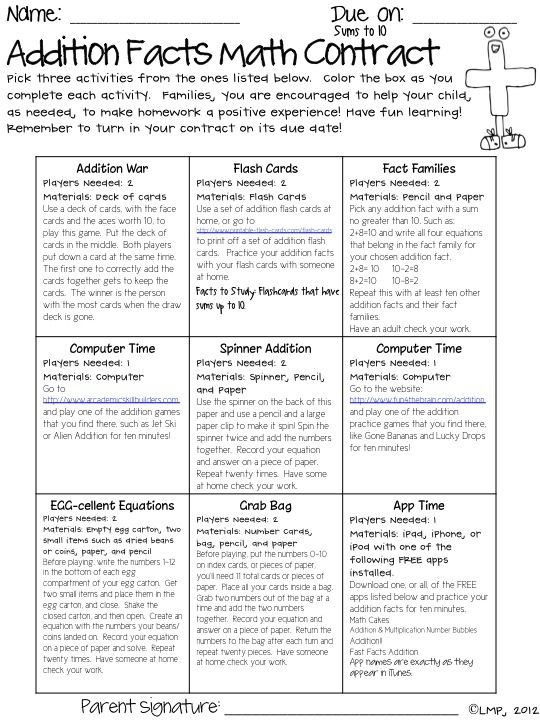 A couple of times on this little ole blog, I've talked about my homework routine, and how math fact practice is a part of it. 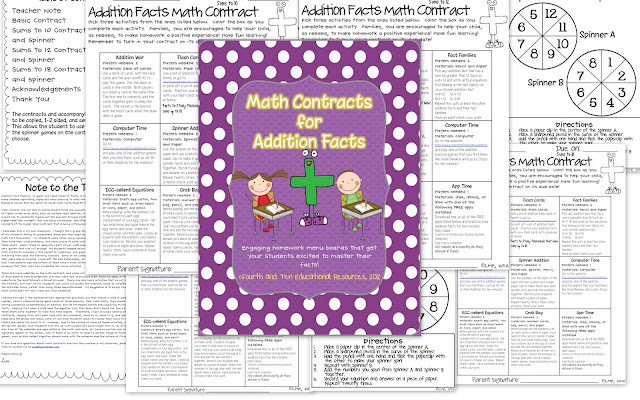 I received many emails/comments about my math contracts, and I have been working hard on making my contracts into something I feel that could be used by all teachers in grades 1-5. So far, I have addition completed, and will be working on subtraction, multiplication, and division soon. I feel that fact fluency is really important. I can vividly remember the tears and frustration my kiddos expressed when I taught third grade and we were doing two and three digit addition, with and without regrouping. Most of those tears happened because they didn't know their basic math facts, and would have to use 100s charts, fingers, or snapping cubes to figure out the answers to the basic facts. Then try to apply the strategies we were currently learning in class for higher level concepts involving addition. For many years, my district has used the Investigations math program. For many reasons I love it. I love the critical thinking components, the rich discussions, and the encouragement to use more than one strategy to solve a problem. However, it does not, at least with our very early edition, address math fact fluency. So for many years, we didn't push that in our rooms, thus developing very strong problem solvers who didn't have multiplication, addition, subtraction, or division facts mastered by fifth grade, making the introduction of higher level thinking concepts using these basic facts very hard. For the past few years, my district has been doing fact fluency assessments, which has helped, but there was still a need for more to be done in terms of math fact fluency. While I tried to fit in a few minutes in class, but it wasn't enough. So I started the math contracts as part of my homework routine. I had my students take them home on Tuesdays, and they were due the next Tuesday. The mix of games and paper practice was the perfect fit for many of my families. For example, on a busy night, they might not have time to sit down and do a spinner game together, but they do have on the suggested apps downloaded on their phone, so little Susy practiced her facts while waiting for dance practice. I do believe strongly in developmentally appropriate practices in mathematics, and believe that my students should have a strong understanding of the concept, strategies mastered for the concept (such as drawing a picture, number lines, etc), and then move onto practice of a concept with for speed and accuracy. With this in mind, I've tinkered with my math fact contracts to create something I think works for everyone. 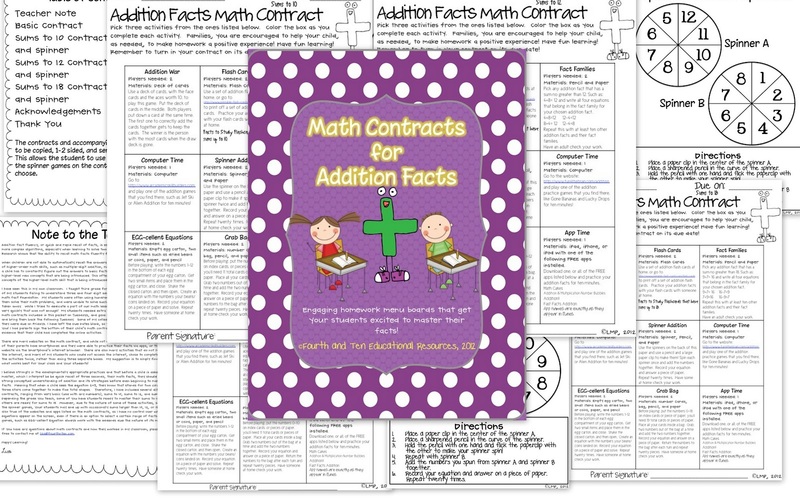 Included in my math contracts for addition facts pack is a basic contract that can just be used for general addition fact practice, as well has contracts that focus on sums to 10, sums to 12, and sums to 18. Well it was appropriate for my third graders and end of the year second graders to practice sums to 18 for speed and accuracy for homework, I don't know if it's necessarily appropriate for a first grader, especially in the beginning and middle of the year. Below is a screenshot for the contract that focuses on sums to 10. I addressed this in my teacher note in the download that there will be some boxes that may go over or under the focus sum. I feel that this is okay. Sprinkling of problems a little above the targeted sum can present a manageable challenge, while problems with a smaller sum than the targeted focus is always a good review! You can check out my math contracts in both of my stores, but you could also win a copy of your own too! Just enter using the Rafflecopter below. I'll be picking a winner on Friday! Also, my followers on TpT, you probably got a message saying Fourth and Ten posted a new item, that IS me! Some of you may have noticed a URL change as well. I'm slowly transitioning to my new name. I hope to have a blog redesign completed soon! I love it!! So cute! I need to try this because my kids struggle with basic facts too! This would be a great addition to our Math Facts program! This looks great Lisa! I've added it to my wishlist on TPT. Cute cute new name... Well miss you in second. These look great! Thanks for reposting about them and having the giveaway!! I would love to win this!! I am coming off of two years teaching reading only and will need all the math fact help I can get! I just found you and got to be your 300th follower! Fact fluency is so important. I would love to win. This looks great. Kids always need practice to develop fluency with math facts! I love this packet!! Our school uses Rocket Math to promote fact fluency. I like Addition Math Magician and Subtraction Math Magician to promote math fact fluency. For both online games, I can determine the addend (+1, -1) or choose two mixed levels to provide differentiated practice. Kids try to answer 20 questions within a minute. The website keeps track of accuracy and reports it too. I like this! I have a routine, but parents don't follow through. It may help to give them more options at home with a contract. Thanks for sharing! This sounds great, we have a huge problem in our district with fact fluency and we have been using Investigations for a long time. Hopefully this will help! Thanks! Love this! Trying to get my kids to learn their math facts can be soo frustrating! Oh, we were just talking about fact fluency today at our p.d. Thank you for share great ideas and buy an essay on this web and cheap prices services for students. I am seriously crazy about this idea! I think a math contract is fantastic! 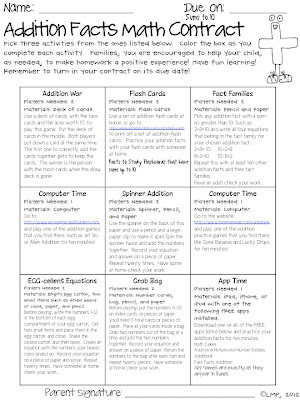 I promote fluency by doing an addition timed test racetrack daily for the last month-month and a half of school. It's a fun way to get my students motivated to learn their facts.